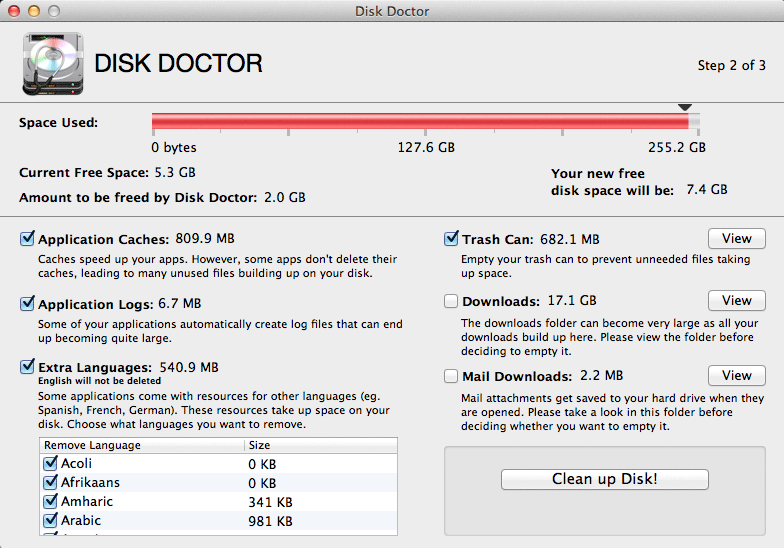 There has never been a great way to clear out the cruft on your Mac’s hard drive. Superfluous files, application caches, unused language files that have been languishing on your drive for years—they all take up storage space that you could dearly use, especially if your computer has a speedy (but limited-capacity) solid-state drive (SSD). You can always use the tried-and-true method of manually sifting through your drive and deleting unnecessary files. But Fiplab has come up with an interesting approach to the problem with its $2 Disk Doctor 2.1 (Mac App Store link). Simply shut down any open applications, open Disk Doctor, and let it scan your drive, and the program then returns a listing of how much space is being used by applications each of several categories: Applications Caches, Application Logs, Downloads, Extra Languages, Mail Downloads, and Trash Can. See the cruft that's devouring your drive space, broken down by category. In my first run, I was able to clear out 1.3GB of hard drive space, mostly by removing assorted language-support files I’ll never need and clearing application caches. (Note, however, that removing language-support files may cause problems with some applications—a few app updaters will refuse to update an application if the language-support files have been removed.) I had Disk Doctor leave my downloads and mail downloads alone. For the Downloads, Mail Downloads, and Trash Can categories, you can preview the files to be deleted by clicking each category's View button. Before you delete that folder’s contents, you can move any important files you want to keep to another folder. One complaint I have about Disk Doctor is that the utility is designed to work only with your Mac’s boot volume—you can’t scan an external volume and free up disk space on it. Even with this scanning limitation, however, Disk Doctor is simple and stable, and performs its function well. I was able to reclaim 1.3GB of drive space on my MacBook Pro, and more than 4GB of space on my 2006 Mac Pro. In an era when solid-state drives—which sacrifice storage size for speedy performance—are in vogue, Disk Doctor is especially handy. It could use a few improvements and additional features, but at its current price of just $2, it’s worth having around. To free up storage space, you can manually sift through files on your hard drive to find candidates for deletion. Or you can save valuable time by having Disk Doctor do it for you.